Kale has been looking great lately! Rather than using it in my typical stir-fry, I have recently been enjoying it raw – throwing it in sandwiches, eating it in salads, etc. It doesn’t have a bitter, pungent taste that many other raw greens have, and its hearty texture prevents it from wilting when accompanying dressings and sauces. One cup of kale (raw or slightly cooked) provides well over our daily need for vitamin A, vitamin C, and vitamin K! It is also a good source of fiber, folate and many minerals. I like this salad because the Caesar dressing and croutons are homemade so I know exactly what’s in it. Oh, and because it’s oh so tasty and refreshing JDon’t let the raw egg yolk and anchovies scare you off – they are nicely balanced by the other components in the dressing. If you’re worried about consuming raw egg yolks, you could omit the egg in this recipe. However, you may lose some of the creaminess factor by doing this. Tear bread into pieces and toss with olive oil and seasonings. Place on a foil lined baking sheet and bake for 10 minutes at 350°F. Wash and tear kale into pieces. Place leaves onto towel to dry or use a salad spinner if you have one; set aside. With the exception of the ¼ cup of olive oil, mix all dressing ingredients in a blender until smooth. Some of the cashews may not fully blend and that is okay; it adds a nice texture to the salad. Slowly incorporate the olive oil as the dressing is blending. Give it a taste to see if it needs additional lemon juice. The dressing will be quite tangy on its own, but is great once mixed with the kale. Toss half of the dressing with the kale to determine how much you need – everyone has a preference when it comes to how much salad dressing is needed. Although this dressing is composed of healthy fats, it is pretty high in fat nonetheless. A little goes a long way; use it sparingly. 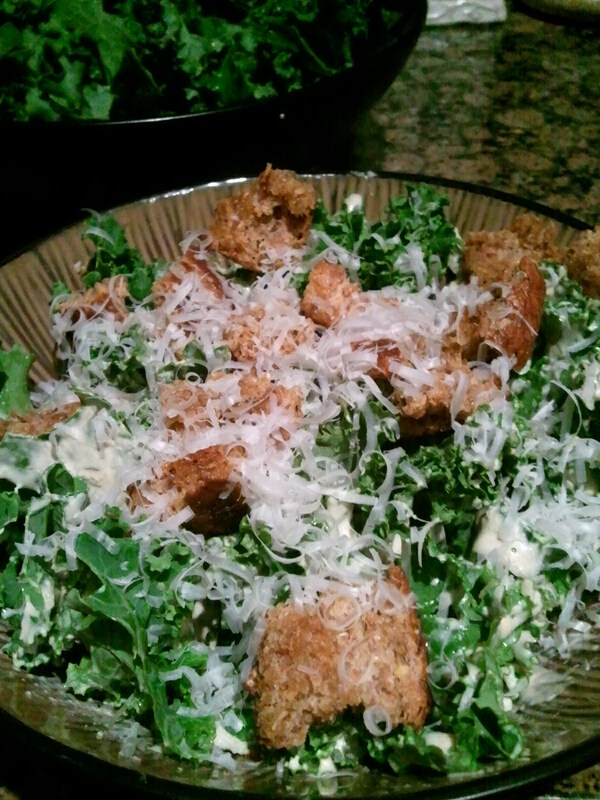 Divide into kale into serving bowls, top with croutons, asiago cheese and black pepper. You might also want to add some protein to this salad to make it a little more filling. If so, I found that canned salmon works wonderfully; it’s easy, it tastes great and it’s a great source of Omega-3 fatty acids.